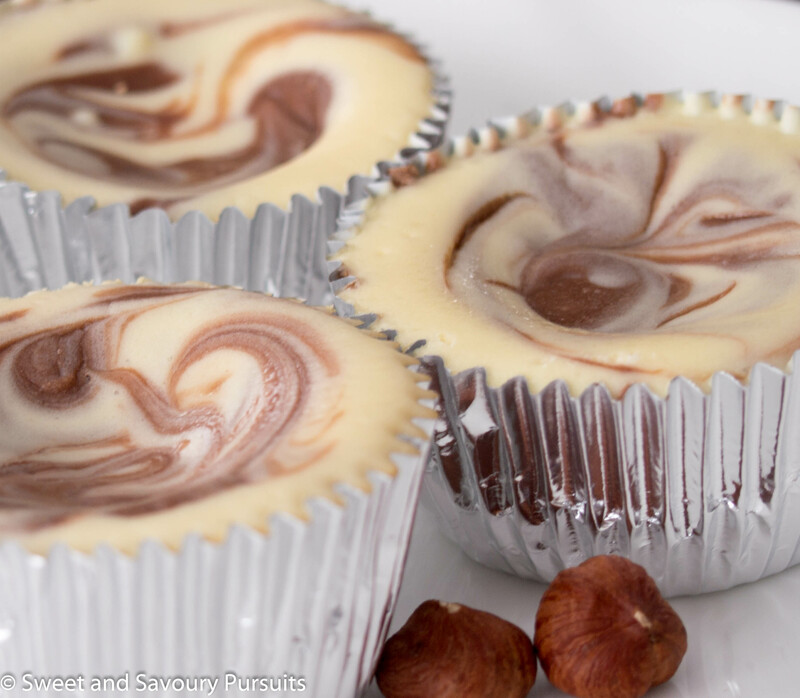 These delicious Mini Nutella Swirl Cheesecakes with a hazelnut and chocolate cookie crumb crust are creamy, smooth and chocolatey. Happy New Year everyone! My family and I are starting this year off with some cheesecake. It’s a family favourite and often gets requested when we have a gathering for a special occasion. For this New Year’s day family celebration I decided to try a Nutella cheesecake recipe from Fine Cooking magazine. Whoever came up with the idea of combining chocolate and hazelnuts, is a genius! Nutella is a staple in my house and we are never without it. 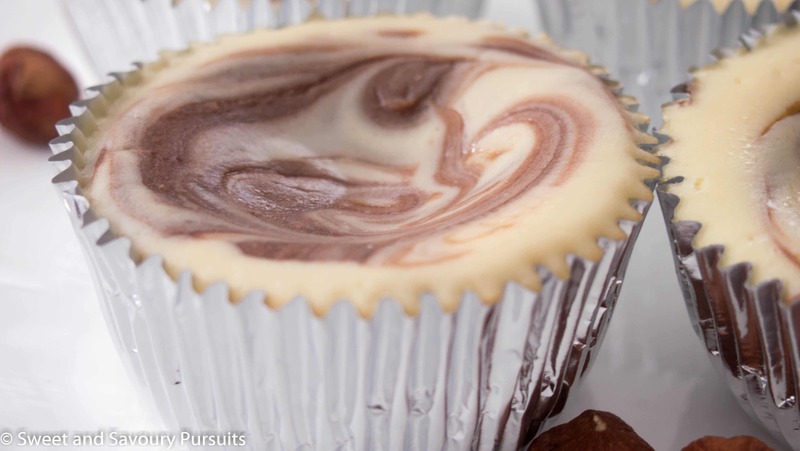 These Mini Nutella Swirl Cheesecakes are delicious! I made some changes to the original recipe by adding ground hazelnuts and using chocolate covered graham cookies for the crust. The mini cheesecakes came out creamy, smooth and chocolatey and the ground hazelnuts in the crust was a delicious addition. Using a regular sized muffin pan, line 16 cups with foil liners. In the bowl of a food processor, grind enough cookies to get 3/4 of a cup of cookie crumbs (I used about 10 cookies, but it will depend on the size of your cookies). Remove the cookie crumbs from the bowl and process about 3/4 of a cup of toasted and cooled hazelnuts. It should give you about 1/2 a cup of ground hazelnuts. In a bowl, combine the cookie crumbs, ground hazelnuts, sugar and melted butter until mixture clumps together. Distribute 1 Tbs of crumbs per foil liner. Make sure to press down on the crumbs so that they stick together, you can use a piece of plastic wrap to press down on the crumbs with your fingers. Place a rack in the center of the oven and preheat the oven to 300°F. Put the cream cheese in the bowl of a stand up mixer and beat (using the paddle attachment) on a medium high setting until the cream cheese is smooth and fluffy, for about 2 minutes. Scrape down the bowl and beat for another minute. Add the salt, sugar and vanilla. Beat the cream cheese until well blended and smooth, making sure to scrape down the bowl often; there should be no lumps. In a separate bowl, break the eggs and whisk them. Add the whisked eggs to the cream cheese batter and beat on medium speed until just blended. Do not over mix the batter once you have added the eggs or the cheesecakes will puff and crack during baking. Measure 1 cup plus 2 tbsp. of the vanilla batter and set it aside. Add the Nutella to the remaining batter and stir until well blended. Divide the Nutella batter evenly among the prepared liners. Next, divide the vanilla batter evenly among the liners, about a tablespoon per cheesecake. The liners should be filled to the top. To create a swirled pattern, run a paring knife or toothpick through the two batters. I found using a paring knife and lifting the Nutella batter over the vanilla batter the most effective for getting the two batters to swirl nicely. Make sure to tap the muffin tins on the counter a couple of times so that the cheesecake batter settles. Bake the cheesecakes until the centers hardly jiggle when the pans are nudged, about 20 minutes. Set the muffin pans on racks and let cool completely. Cover and refrigerate the cheesecakes for at least 6 hours before serving. * To toast hazelnuts, heat oven to 350°F. Spread hazelnuts on a baking sheet and bake for 10 minutes, stirring nuts once after 5 minutes. Let cool. Delicious!! By far, one of my favorite desserts! Thanks Ghina! Cheesecake is also one of my favorite desserts. And this recipe is a keeper. I’m so happy to hear that you liked them so much. Do let me know how they turn out with you!